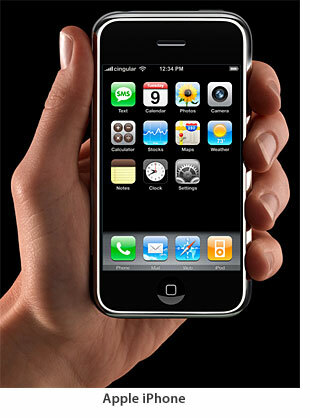 “Apple has finally announced its long-rumored iPhone. True to the Apple ‘i’ tradition, the iPhone is filled with features and touts an innovative interface more akin to a kiosk or video game than a telephone… Can it succeed? Frankly, and contrary to the reactions of Apple fans and the stock market, I am pretty skeptical. I don’t think this device will meet the fantastic predictions I have been reading. For starters, while Apple basically established the market for portable music players, the phone market is already established, with a number of major brands. Can Apple remake the phone market in its image? Success is far from guaranteed,” Jack Gold, founder and principal analyst at J.Gold Associates, writes for Computerworld. Has Mr. Gold even watched Steve Jobs’ keynote and seen the iPhone demonstrated? Ultimately, Mr. Gold’s advice to “wait a few months to see how this all shakes out” coupled with his threat that Apple’s iPhone “could ultimately become an orphaned, stand-alone music player” just doesn’t smack of FUD, it is the very definition of FUD. Obviously hasn’t watched the keynote. I actually agree. There remains a lot of questions to be answered. I think developers are going to be hoping that this is a new platform for them to release their products for. At the moment, it doesn’t seem to be leaning this way to keep that closed system environment for the highest level of consistency. Connecting with Exchange networks is crutial while outlook isn’t whatsoever if they are looking to make this a practical “smartphone” or at least corporate tool. Battery life I think will be an issue as well. I’m buying an iPhone, but I’ll be waiting for a 2nd or even 3rd generation before I commit to it’s gloss and impressive features. This bozo hasn’t bought a blackberry. Cost me $450 bucks with no service agreement. Remember all the “MORONS” who were parading around, predicting doom and gloom for Apple after the iPOD Mini was announced? The iPHONE nay sayers will be eating just as much crow as the moronic iPOD Mini nay sayers did. No matter how cool a product is, there will always be that handful of envious losers who have to try and piss in everyone elses corn flakes. I’m definitely going to wait a few months. Until June. He’s shortsighted that’s all, and he’s not alone of course. Just look what morons predicted iPod was set to fail..and you get the picture. The proof is in the buying. Count me in x5. And just imagine when we can ditch landlines and use VOIP and WiFi for 80% of all it’s activity! Jaysus,,,how many freakin e-mail apps do you want on a phone,? How many browsers, calculators? What a major league, uninformed FUD spewing, dork. Oh yes, please give me Versamail and the Palm internet browser. What? There are not a zillion apps some of which are a better email or browser client? Oh, and by the way, I paid $500 for my Palm Treo 700p about 6 months ago with a 6 month contract. I hate it. It picks up so much background noise that the people I’m talking to can’t hear me. I find the internet portion of it to be completely unuseable. I intend to drive over it on my way home from picking up my iPhone. I’m canceling my contract early and paying the damn fee.